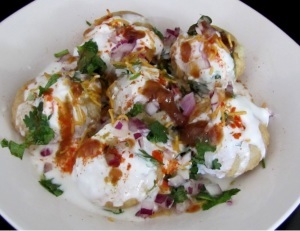 Dahi Puri: Dahipuri or Dahi puri is an Indian snack which is especially popular in the state of Maharashtra. The dish is a form of chaat and originates from the city of Mumbai. It is served with mini-puri shells (golgappa), which are more popularly recognized from the dish pani puri. Dahi puri and pani puri chaats are often sold from the same vendor. Each dahi puri is intended to be eaten whole, like pani puri, so that the spectrum of flavours and textures within may all be tasted together. Once cooled, peel and chop the potatoes. Chop the onions, tomatoes and coriander leaves finely. Beat the yogurt/curd with a whisk, till smooth. In a plate, arrange the mini-puri shells (golgappa). Usually 4-5 puris are served per plate. Break the puris from the top, to create space for the potatoes and chutneys. Stuff the chopped potatoes in the puris. Add the chopped onions, tomatoes on top of the potatoes in the puris. Sprinkle some chaat masala, cumin powder, red chilli powder and black salt on the puris. Top the stuffed puris up with the green chutney, sweet chutney and red chutney, to your taste. Add the curd/yogurt in each puri. Again sprinkle some chaat masala, cumin powder, red chilli powder and black salt on the puris. Add the sev on top in a way that each puri gets covered with sev. Garnish the puris with chopped coriander leaves. Dahi puri is ready to be served. Serve immediately, as the puri’s become soggy as the time goes by. If you have any queries regarding the Dahi Puri recipe, please leave a comment.